Multi-purpose small animal Intensive Care Unit, providing the warmth and isolation essential for critical care needs for a variety of young, sick, injured or weak animals and birds. With an internal floor area of around 24cm square, the TLC-30 Eco is designed for rescue and recovery of small mammals or birds or for the intensive care of young. The unit is equally suited to wildlife rescue or for pet breeders, where portability and ease of cleaning are key benefits. The TLC-30 Eco is portable: it has an integral carrying handle and is stackable. It operates at 12v for safety and can be powered from the mains with the adaptor (supplied) or from a car cigarette lighter (adaptor available separately, part number: 15.45). The clear door is made of tough, UV resistant polycarbonate that can be closed and latched with one hand. The TLC-30 Eco displays temperature on a spirit-in-glass thermometer visible through the clear door. Simply alter the temperature by turning the temperature dial to adjust between room temperature and 38°C. Temperature stability is maintained by a small fan which runs at low speed to minimise noise and disturbance. The unit is also stackable - the feet from one unit locate in sockets in the cabinet of the unit below. Cleaning the TLC-30 is easy: the hinged door lifts off and the working parts and fascia simply unclip and slide out - no tools needed - leaving the cabinet empty for deep cleaning. The adjustable vent allows plentiful ventilation in warm rooms or at low set temperatures which is important for larger animals. Protected by Biomaster antimicrobial additives - to reduce the risk of infection Brinsea incorporate Biomaster Antimicrobial Protection into our TLC-30 cabinets during manufacture. Biomaster Protection is embedded within the plastic itself which prevents the growth of harmful bacteria helping to provide the optimum environment for young animals. 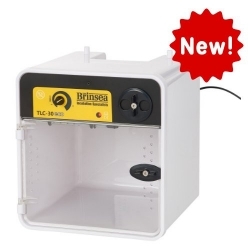 As with all Brinsea's products, the TLC-30 Eco comes with a FREE 3 year guarantee, subject to online registration. MacEoin General Merchants Ltd are Brinsea Products SOLE distributor for Ireland for over 30 years.